Although I claim to be retired, I still teach a few workshops each year. I try to make them relaxed, fun, and at the same time, productive. makes a painting miss the mark, or what makes it successful. 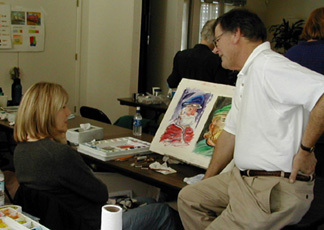 My workshops teach you how to be the best painter you can be. You learn more about how to make your art personal and powerful. We also have a lot of fun. After all, why paint, if it's not fun, too? so be sure to check early for availabilty. Click here to visit my WordPress site, where i am keeping an updated list of my classes! Taught by Katherine Chang Liu, Fran Larsen, Skip Lawrence, Alex Powers and yours truly. The workshop typically runs sometime around April, and it's filled with some of the most interesting artists you'll ever meet. Like you, they're working on growing and becoming more confident, better painters. All levels are welcome. It's unlike any workshop you've ever taken!